Apple iDVD is a DVD creation software. It allows the user to add QuickTime Movies, MP3 music, and digital photos to a DVD that can then be played on a commercial DVD player. With iDVD you can premiere your movies and photo slide shows on a professional-quality DVD with animated menus, buttons, scene selection and more. All customizable to suit whatever you're sharing. iDVD uses the concept of themes to allow the easy creation of DVD menu systems. ...... The themes have 'drop zones', onto which movies or photographs can be dropped. The theme automatically animates the drop zones if necessary. Apple iDVD has more than 150 different Apple-designed animated themes for your movies in both widescreen 16:9 and standard 4:3 formats. These themes can be applied to multiple levels of your DVD. Apple iDVD integrates with the rest of the iLife suite. iMovie projects and iPhoto slideshows can be exported directly to iDVD. In the case of iMovie projects, scene selection menus are automatically created in accordance with chapter markers that are set within iMovie. 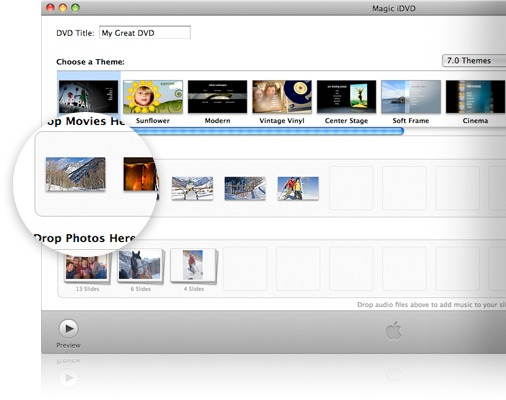 Apple iDVD also has a 'Media' area that provides access to the user's iTunes library, iPhoto library and Movies folder at any time, and there is a map view, which shows the current project's menu system in a graphical form. Another feature is the ability to hide or show an approximation of the 'TV safe area. It can also intergate with Final Cut Express and Final Cut Pro. Qweas is providing links to Apple iDVD 7.1.2 as a courtesy, and makes no representations regarding Apple iDVD or any other applications or any information related thereto. Any questions, complaints or claims regarding this application Apple iDVD 7.1.2 must be directed to the appropriate software vendor. You may click the publisher link of Apple iDVD on the top of this page to get more details about the vendor.